grandma's cookie jar: Children's Day - and Night Fun! I was browsing on Pinterest and found a really fun idea for Children's Day . . . or for a sleep-over or a fun Summer evening . . . and it would make a great gift for your grandchildren for Children's Day! 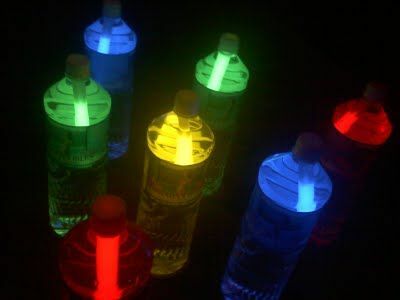 All you need is at least seven large, clear, empty plastic bottles, water, colored glow-sticks and a ball then stand back and watch the fun begin . . . be sure to have a camera handy! Follow this link and you'll find the details for making your own set of glow-in-the-dark bowling "pins"! You could wrap up each "pin" and the ball separately for a gift which you could give to all your grandchildren and one which they could share - because it is surely much more fun to play with this with others! Enjoy!